Nandina domestica nana ‘Moon Bay’ is a dwarf cultivar with many great attributes. 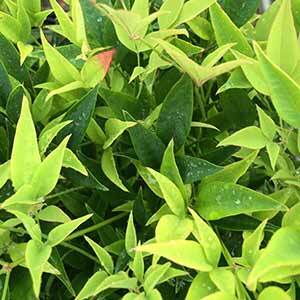 Great new foliage, excellent winter colour, evergreen and drought tolerant once established. The foliage is much more attractive than N. domestica ‘Nana’, Nandina Moon Bay has a good upright habit, and in our opinion the excellent ‘Moon Bay’ and ‘Gulf stream’ seem to by synonymous. This is a Nandina that has great colour changes through the season, bringing added interest to a range of landscaping applications. It is also easy to prune and look great as an informal hedge as a ‘filler’ in the border or used in mass plantings as a ground cover. One of a number of Heavenly Bamboo varieties, Nandina Moon Bay has the advantage of brilliant autumn colour and being naturally low growing. Once established, care requirements are minimal. A little fertiliser once a year, some water through the first summer and some light pruning as required. This is also a Nandina that takes well to pruning. The foliage is fine and heavily divided, leaves are small and the plant can be pruned back with shears electric or hand as desired. Because of its natural compact bushy low growing habit, pruning is not required on a regular basis, another advantage. Height – Moon Bay will reach 1m, and this is it optimum for ‘good looks’. It can get taller if allowed. Soil – Humus rich well drained, although tolerant of a range of conditions. Flowers – Insignificant, small white star shaped sometimes followed by small red berries. Container growing – Yes, a very easy low care container plant that will handle harsh conditions of balconies and terraces. Botanical Name – Nandina domestica Moon Bay. Common Names. – Nandina Moon Bay, Heavenly Bamboo Moon Bay, Moon Bay Bamboo. Nandina Moonbay is available from the following wholesale growers.